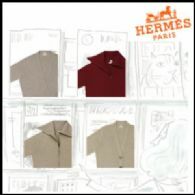 Sydney, Dec 6, 2010 (Global Fashion Wire) - Hermes International SCA's family shareholders will set up a holding company for more than 50 percent of the Hermes share capital, bolstering their defenses after LVMH Moet Hennessy Louis Vuitton SA acquired a stake. The founding family members, who own 73.4 percent of the Paris-based luxury-goods maker, met on Dec. 3 to discuss the company's future after LVMH, the world's largest maker of luxury goods, built up a 17.1 percent stake and said it would consider buying more. The family "have reaffirmed their unity and their confidence in the solidity of their current control of Hermes," it said in an e-mailed statement today. The commitment to create the majority holding is "irrevocable." The holding company will have first right of refusal on the remaining shares held directly by the family, it said. Hermes, the maker of Birkin and Kelly handbags, has said since October that the family was "fully united" in its desire to retain control of the 173-year-old company. Hermes hired BNP Paribas SA and Bank of America Corp. as advisers last month to help fend off a possible LVMH takeover bid. LVMH, which has said it doesn't intend to seek a board seat, can't bid for all of Hermes until at least April 23, according to French regulations. Hermes fell 9.3 percent in Paris trading on Dec. 3, ahead of the family meeting. The stock has surged 61 percent this year, boosting the company's market value to 15.9 billion euros ($21.3 billion). LVMH stock declined 0.4 percent, paring its gain this year to 55 percent and valuing the company at 59.6 billion euros. As an SCA, or Societe en Commandite par Actions, Hermes has a structure that allows members of its founding family to keep control of decision-making even if they become minority shareholders. Bertrand Puech, chairman of Emile Hermes SARL, which represents the family shareholders, has said all 73 adult descendents of Hermes's founder have voted unanimously to keep control. The proposed holding company is subject to approval from the French stock market regulator, Hermes said today.